Whale watching is one of the most exciting ways to spend time on the water. Kendall Barbery, who manages our Green Infrastructure Program, shares tips to help make sure both you and the whales stay safe. Signs of nearby humpback whales include spouts, light foamy patches of bubbling water, and the fins and flukes of the whales themselves. • Humpback whales sometimes feed by blowing bubbles beneath a school of fish, called bubble netting, which forces the fish to the surface and makes it easier for the humpback to lunge with their mouths open wide and swallow the school whole. Avoid the bubbling water like you would avoid a rocky shoal! A run-in with a feeding humpback whale is bad for all mammals (and boats) involved. • Never approach a whale head-on, and don’t obstruct its path. If a whale is approaching your boat, move out of its way. • Keep your speed below 7 knots if you are within ½ mile of a whale. When boats get too close and crowd a whale, it impacts their behavior and their ability to eat their breakfast, lunch and dinner. • Maintain your distance! 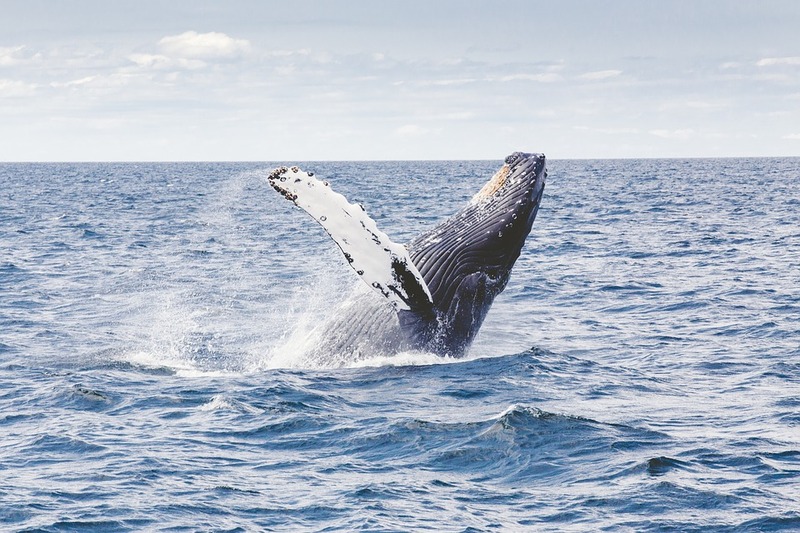 Though regulations in the northeast allow boaters to view humpback whales within 100 feet, it’s best for the whale if recreational boaters maintain a distance of at least 100 yards. If you are within 100 yards of a whale, put your vessel in neutral and limit your viewing time to 15 minutes. Trust us, that spout isn’t water – it’s mucus and whale breath being released through the humpback’s nostrils, and it carries a stench far worse than morning breath. • If other boats are already in this close-viewing zone, stand down and wait your turn. Use your VHF radio (channel 9, 13, or 16) to coordinate your viewing efforts with other boats. • Share these guidelines with your boating friends! • Stop, be still, listen, and enjoy. For more information on safe whale viewing, visit The National Oceanic and Atmospheric Administration Whale Watching Guidelines. Hi Jyll! Thanks for your question. Humpback whales aren’t aggressive towards human, so they don’t represent any significant threat to swimmers, kayakers or paddle-boarders. These are amazing creatures that we have the opportunity to observe in the Sound – but it’s important to keep an eye out for signs of nearby whales in order to maintain the distance required by law. Swimmers are especially unlikely to be affected, as large whales won’t come into shallow water intentionally. If you do see a whale at a swimming beach, report it to park/beach officials or CT Department of Energy and Environmental Protection/NY Department of Environmental Protection so they can keep an eye on it. While swimmers and kayakers are not in danger, they do need to abide by the same regulations imposed on larger boats. It’s possible that kayakers might have close encounters – but anybody in and around the Sound needs to keep their distance from whales when they see them. If you’re kayaking and see a humpback whale, paddle away from it slowly and try to maintain the 100-yard buffer recommended for other boats. We do recommend that people who are kayaking or paddle-boarding in groups stay close together in a cluster, rather than spreading out and potentially surrounding the whale.